Rabies is a preventable disease transmitted from animals to humans. It is transmitted by animal (usually dog) bites, and is almost always fatal. It targets the brain and nervous system. The first symptoms of a rabies infection are flu-like, with fever, headache, and generally feeling unwell. You may also experience anxiety, or pain at the site of the bite or scratch. A few days later, symptoms become more severe, and include confusion or aggression, hallucination, frothing at the mouth, difficulty swallowing, difficulty breathing, paralysis, or muscle spasms. Areas with high-risk of rabies infection include Afghanistan, Africa, Argentina, and South/Southeast Asia. An estimated 55,000 cases are contracted annually worldwide. In the event of an animal bite in an affected region of the world, you are advised to wash the bite with soap and running water, clean it with antiseptic or alcohol and leave it uncovered, and seek immediate medical advice. 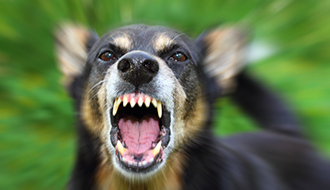 Rabies is caused almost exclusively by a bite or scratch from an infected animal. It is most commonly caused by a dog bite. Dogs in the UK do not carry rabies, but it is sometimes found in wild bats, raccoons, foxes, cats, mongooses, and jackals. Rabies can also be contracted if an infected animal licks an open wound. Our doctors are available for consultation on any aspect of this disease and its vaccination. Please use our online booking system or give us a call to make an appointment. I’ve been bitten by an animal and I’m worried I’m at risk. What should I do? Immediately clean and disinfect the wound. Start by washing with soap under running water for several minutes, and then disinfect with alcohol or iodine. It is then very important that you see a healthcare professional as quickly as possible – don’t wait. What will the doctor do if I’ve been bitten? Whether or not you have already been vaccinated against rabies, you will be given another 2-5 doses of the rabies vaccine. A shot of immunoglobulin may also be advised. What are some safety precautions if traveling in an area that is at risk? Avoid contact with animals. Those infected with rabies may not necessarily behave differently to those which are not. Avoid touching dead animals. Get vaccinated before you travel, if you have not already done so.